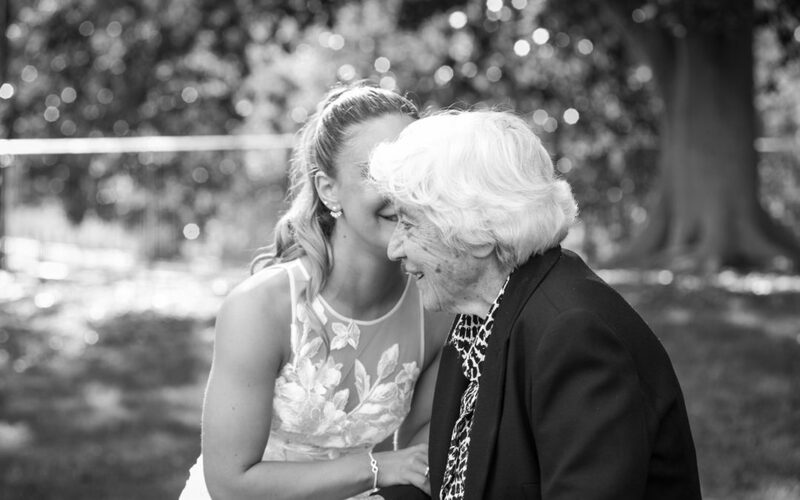 Photo: ‘My yiayia (grandmother), Georgia, who I was named after, often remarked she would not live to see my wedding day, but thankfully we were pictured here together in November, 2018’ – Dr Georgia Rowley. When faced with the seemingly unrelenting and morose reality of death, some people close to the deceased individual may feel compelled to continue the relationship in death, in myriad ways. Often referred to as ‘continuing bonds’, or ‘continuing relationships’, these bonds serve to acknowledge the loss of the person, to validate their life, impact and memories, and to solidify their presence in the life of the survivor. Cultural and religious factors influence continuing bonds. For example, such relationships appear more normative among some groups than others. One example conjuring vivid imagery is the ritualistic ‘Day of the Dead’ (Día de Muertos) holiday celebrations in Mexico, where families and communities hold vigils and lively celebrations in honour of the dead, actively normalising death. I am shaped by a third-generation Greek-Australian migrant lens, with citizenship and roots in both countries. I am wholly influenced by my own experiences of the death of loved ones, in addition to broader notions of the Greek-Australian cultural ‘performance’ of, or expectations around, death and mourning. In 2016 I submitted my PhD in Public Health, exploring older first-generation Greek migrants’ experiences of widowhood and associated wellbeing, in urban and rural South Australia, from a social determinants of health lens. During this study, I conducted qualitative in-depth interviews with 41 older adults in their native language before translating and transcribing this data to English for wider dissemination. I was curious about their life-courses and health, and was compelled to explore the impact of spousal loss on wellbeing in later life. Responses to the death of a loved one are individual; no two people will react in precisely the same way. Bereavement, mourning, and widowhood are experiences associated with distinct implications for daily life. Bereavement is the period of grief and loss immediately following death, whereas mourning denotes the actions and feelings associated with grief expression, often reflecting cultural and religious practices. Many factors actively determine the experience of widowhood and subsequent adjustment, including age, gender, religion, social support, marriage roles, and spousal dependency. Among different cultural groups, there are preconceived, gendered notions of what constitutes appropriate behaviour after the death of a loved one. Deviations from fixed cultural roles and expectations may have social ramifications within the community. Many older Greek-Australians subscribe to notions of how widowhood should be ‘performed’ within their cultural framework, largely influenced by Orthodox religion. For many older Greeks, distinct ways of grieving, including enacting mourning rituals, conducting memorial services, and maintaining continued relationships to the deceased have implications for their sense of identity, coping, and well-being in widowhood. Such normative expectations are particularly pertinent where individuals have sustained strong traditional familial and cultural values despite living overseas for decades. Stavroula (female, age 67, widowed 20 years) explained: “Religion helps you in some way…gives you patience…courage…strength to cope with pain…”. Most individuals I spoke to were acutely aware that the way they mourned or maintained continued relationships to their deceased spouses was largely non-normative in the wider Anglo-Australian context. Nikita (female, age 83, widowed 18 years) stated: “Other groups don’t have these [traditions]…don’t wear black…soon after, they re-marry…Australians don’t conduct memorial services…They hurt for their person…miss them, but they don’t do the things we do”. Indeed, openly discussing death and dying in Australian society is typically avoided, with stoicism and less overt ways of grieving preferred. Mourning rituals provide the opportunity to display grief emotionally or behaviourally, in line with predetermined culturally sanctioned templates for grieving. Possessing a meaningful grief framework may help these individuals understand, incorporate, adjust to and accept the finality of death. For Greeks, there exist a number of observances which they may choose or feel subjected to follow, consistent with collectivist cultural, societal, and gendered norms and expectations. There are clearly delineated roles and customs relating to performing elaborate, frequent, strict, and long-lasting mourning rituals and grief display. Continued emotional relationships to the deceased are advocated, and believed to be integral in providing meaning and identity in widowhood. Rituals and customs like wearing black to honour the deceased are considered significant and beneficial for the well-being of both surviving and departed spouses. Nikita (female, age 83, widowed 18 years) remarked: “I filled up the car with all my coloured clothes, I thought to myself, ‘I won’t live to wear brightly coloured clothes’…I got rid of them all”. Individuals in my PhD study conveyed the sense that conducting rituals allowed them to retain a sense of strength, identity, pride, happiness, and self-worth in widowhood. Interviewees shared rich accounts of the varied ways in which they maintained spousal relationships, including conducting mourning rituals and memorial services, communicating with the deceased, dreaming about their partner, openly talking about their partner with others, and visiting the cemetery. Additionally, displaying photographs, commemorating special occasions, and retaining their possessions or giving weight to aspects of their spouses’ personality or interests also contributed to these relationships. During our interview, Manolis (male, age 80, widowed 2 years) led me to cupboards brimming with his wife’s clothes: “She got that many clothes here, I can’t get rid of any…I know she never come back, I can’t have a heart to get rid of it (sic)…I don’t feel right, that she is disappointed. She think maybe I’ve forgotten (sic)…After you’ve been married that many years…It’s very hard to forget it…Sorry…to show you this”. Individuals who are newly widowed navigate ambiguous and precarious identities. In widowhood they must find ways to cope in a society in which they have little experience living in as a lone person. Bereaved individuals may feel socially vulnerable, especially among couples. Interestingly, there are individuals who many years later still identify with an enduring widowed status, and actively ruminate the loss, akin to those more recently widowed. Interestingly, remarriage was shunned by the individuals in my study, which in itself could potentially represent another method by which to maintain continued relationships. Notions of marriage continuity were prioritised, even in death. Stamatis (male, age 80, widowed 11 years) stated: “We had a good life. I respected her…she respected me…But I remained alone…didn’t get another wife…I wouldn’t put another woman inside my house”. Continuing bonds thus encouraged the retention of prior married identities as a ‘wife’ or ‘husband’, especially among individuals with positive marital experiences. Such identities were often important for coping in widowhood. Maintaining continued bonds to the deceased may help surviving spouses forge new, positive identities in their loved one’s absence. In embracing continuing bonds, individuals may feel as though their spouse’s spirit lives on. Savvas (male, age 85, widowed 4 years), who conducted rituals at nine days, 40 days, six months, one year and two years, explained: “We do this so that the person who has died, up in heaven, can be happy… We need to do these traditions…for a religious reason, to show your spouse your love”. Continuing bonds may facilitate coping by supporting and comforting the survivor, and securing the place of the deceased into the social fabric of survivors’ lives. Indeed, existing literature maintains that fostering continuing bonds enhances psychological well-being. It is also conceivable that conducting regular and long-lasting rituals may result in frequent rumination of spousal loss, which may lead to increased sadness. However, most individuals in this study spoke positively of conducting rituals and maintaining bonds. This supports existing theories on the potentially protective nature of continued bonds in widowhood, by providing the bereaved with strictly defined roles to be enacted. Ritual performance conceivably represents a positive aspect of the widowhood experience in Greek culture. Rituals are predominantly perceived to be ‘women’s work’ in Greek society, especially pertaining to preparing regular memorials and gravesite rituals. For widows, performing culturally normative widowhood rituals and retaining continuing bonds to deceased spouses preserves identity and social standing, associated with husbands in traditional Greek society. Calliope (female, age 70, widowed 1 year) remarked: “[Widowhood] is bad for a man, but it is worse for a woman, because she loses her worth from her husband”. Penelope (female, age 71, widowed 13 years) felt her continuing connection to her husband provided a sense of strength, identity and pride in widowhood: “I think my husband is next to me. I’m not shy to say what I feel. I am proud…I have such strength, that my husband is beside me, I haven’t lost him…I am alone, but not alone…because I have his pride. I am Mrs. [surname]…He is by my side”. Widowed Greeks (especially women) are not typically encouraged to ‘get on’ with life following loss, and retaining strong bonds may hinder the ability or willingness of some women to ‘move on’ following the loss. Indeed, failing to uphold such bonds and enact mourning rituals in widowhood heightened vulnerability to gossip or stigma within the Greek community. Interviewees often distinguished their experiences from Anglo-Australians, citing cultural differences and the non-normative nature of their widowhood experience and associated sustained relationships to the deceased. Comparing their experiences to other cultures gave weight to notions of a somewhat public and nuanced way to grieve or mourn spousal loss among their cultural group. Such perceived non-normative experiences among Greek migrants may compound life-course experiences relating to ‘ageing in a foreign land’, contributing to perceived social exclusion from mainstream society. Evangelia (female, age 75, widowed 18 years) highlighted: “We Greeks are different to Australians…Greeks, when we lose our spouse, no one steps foot in our house. We don’t want remarriage, and neither do our kids…We mourn continuously”. Reflecting collectivist norms among Greek migrants, it is not uncommon for other family members like children and grandchildren to also maintain their own continuing bonds to the deceased. Whether such ritualistic grief performances will continue to be upheld by future generations (once first and second migrant generations have passed), remains to be seen. This will likely depend on subsequent generations’ levels of acculturation to wider Anglo-Australian society, and their personal willingness and efforts to affiliate with their cultural identity in this manner and uphold notions of ‘Greekness’. Coping with the loss of a loved one will never be straightforward, and reorganising one’s life in the aftermath will likely always present myriad challenges. However, I would relish in seeing a more widespread understanding of continuing bonds to the deceased at a community level. If maintaining continued relationships assists individuals to cope with loss, then such approaches should be embraced. Let’s teach future generations to not fear death; rather, to embrace it as a normative life-course event. Re-conceptualising death can conceivably lead to increased understandings of what it means to live well. We have work to do in normalising death and dying, and creating compassionate and empathetic communities in which to reside.